Though never one to argue for more sponsorship and advertising, we did rather enjoy learning of the gentler, resourceful beginnings of publicity caravans to promote local goods and businesses along the route of le Tour de France, which not to be cynical, was itself launched in 1903 to boost sales for a national sports publication. 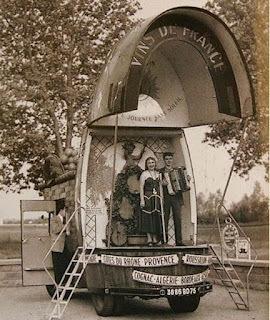 The first collaboration occurred in 1929 between the race’s organisers and chocolatier Menier (whose family came into possession of Chateau Chenonceau) and has escalated since but I don’t think that the floats of today were nearly as creative and eye-catching as those parades of the past. Find a quite expansive and gaudy gallery at the link up top.